As I have said before, teachers, parents and students who care about preserving public education have been backed into a corner where the only weapon they have left is their bodies. A quality education has come to be seen as a human right. Despite the fact it is not written into the Bill of Rights, we have learned that education is a hallmark of a functioning and healthy democracy. As citizens, we have come to expect a quality education as our due. This is why the corporate education reformers have been winning the public debate. They have clothed their privatization schemes in righteous rhetoric about our children being entitled to great schools. They have used their wealth and political power to beat teachers and their unions into submission. In New York, as well as in many other states, they have created a new regime that forces all children to be nothing but test-takers focused on short-term goals. It is no coincidence that the hedge-fund managers and Wall Street bankers were lauded for their short-term thinking of turning fabulous profits overnight. That was until the economy crashed. Yet, they want students to spend 13 years of their lives doing little more than preparing for the next exam. The only number that will matter is the next number they receive on the next bubble-in test. Sounds just like Goldman-Sachs or AIG executives who see no further than the next financial quarter. Parents across the country are making the connection between the push for more education “data” and the push for ever-higher quarterly earnings on Wall Street. Much like the data of quarterly earnings, the data of testing does not reflect much real value at all. They are arbitrary, incomplete and, sometimes, out-and-out fudged numbers that fuel a myopic system where only a few reap any real benefits. That is why a National Opt-Out movement is developing. Parents who are involved in their children’s educations, as well as teachers who are aware of what education reform really means, are pushing to keep their kids home on test days. At the very least, they are calling for students to hand in blank exams so the private education data companies (Like Joel Klein’s Wireless Generation), have no data to mine. National Opt-Out is the new incarnation of civil disobedience. 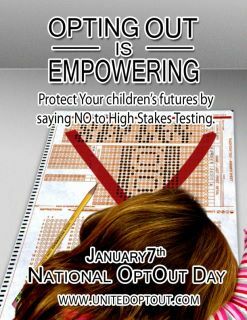 Much like the Civil Rights protestors of the 50s and 60s, National Opt-Out seeks to disobey an unjust regime by using their bodies to bring that regime to a halt. They are defending one of our most cherished civil rights: the right to an education. A recent article on the New York City Public School Parents website examines the problems with measuring kids by data and gives a sense of the growing frustration that is fueling National Opt-Out. Also, do not forget to show up to the discussion surrounding the New York State teacher evaluation deal and the role of standardized testing therein. It will take place this Tuesday at 5:30 pm at Murry Bergtraum High School. As wehavespokenout against high-stakes testing this year, after our family was first directly affected by it through our third-grade son, we have had the wonderful experience of connecting with like-minded parents in New York and across the country who are also determined to put education back into the hands of educators. We have also heard from many teachers who, unlike parents, are often under the direct threat of being fired for speaking out against run-away testing in our schools. We would like to put forward, with her permission, the thoughts of one such teacher working in Brooklyn. What follows are her words, taken from our recent correspondence with her, with comments from us interspersed in italics. Our position is simple: we want our children to be educated by teachers like this one, who care about children and learning, who recognize and protest counterproductive teaching methods that are forced on them by the state. We will not rest until parents and teachers are once again in charge of education policy, and teachers are free to use their knowledge and expertise to make learning the joyous experience it should be for all our children. This entry was posted in An Embattled Career, education reform, Politics, School, teaching and tagged Civil Disobedience, Corporate School Reform, education, Education as a Civil Right, Education Reform, National Opt-Out, NYS Teacher Evaluations, Schools, Standardized Testing. Bookmark the permalink. The idea for this event emerged out of a GEM steering committee meeting in Feb. We postponed once because the UFT announced it would be doing some protest on March 15 which turned out to be the usual nothing. A great panel has been recruited headlined by Carol Burris and joined by NYC teacher/writers/bloggers Gary Rubinstein and Arthur Goldstein and joined by leading parent activist Leonie Haimson. After the panel speaks we will try to come up with strategies for fight back. I certainly hope this can be the springboard into something greater. I will most likely be there. Excellent analogy between (manipulated and often fraudulent) short term corporate profit statements and (manipulated and often fraudulent) high stakes test scores. Thank you and how sad that there is so much overlap between the people who are pushing both. How I wish I was in New York to support this.